Comic books and comic book characters are great fun for people of all ages. They're a chance for people to escape the realms of everyday life and jump into a world where good overcomes bad and people live happily ever after. Kids especially love nothing more than roaming around pretending to be their favorite superhero as they save us all from evil. While Superman and Batman have always been favorites traditionally, there’s another wave of famous superheroes swiftly closing in the ranks. We are talking, of course, about the ever-popular Fantastic Four. Who Are the Fantastic Four? For the very few of you out there that don’t know who the Fantastic Four are, here’s a little background information. Created in 1961 by writer Stan Lee and artist Jack Kirby, The Fantastic Four is a group of fictional superheroes that appear in various Marvel Comics and are portrayed as a sort of dysfunctional yet loving and loyal family. The group first formed after discovering they’d each developed amazing superpowers following the emergency crash landing of an experimental rocket ship. Mister Fantastic: Real name: Dr. Reed Richards. Reed is a scientific genius who has the ability to bend, twist and re-shape his body into whatever frame necessary at the time. He is seen as the leader of the group with an almost fatherly role. Reed often comes across as pragmatic in the series, yet sometimes a little dull. He blames himself for the crash and how it transformed each of them, especially Ben Grimm. Invisible Girl/Woman: Real name: Susan Storm. At the start of the series, Susan is Reed’s girlfriend. Later in the story, she becomes his wife. Her powers enable her and others to become invisible. Later on down the line, Susan develops the ability to create invisible force fields, which she often uses as both a defense and offense mechanism. The Human Torch: Real name: Johnny Storm. Johnny is Susan’s younger brother. His powers give him the ability to control fire in such a way that he can project in from his body. He also has the ability to fly. The Thing: Real name: Ben Grimm. Ben is Reed’s best friend. As a result of the crash, Ben transformed into an orange, rock-like monster featuring extremely high levels of strength and durability. Ben often mopes around feeling depressed and angry about the new him. 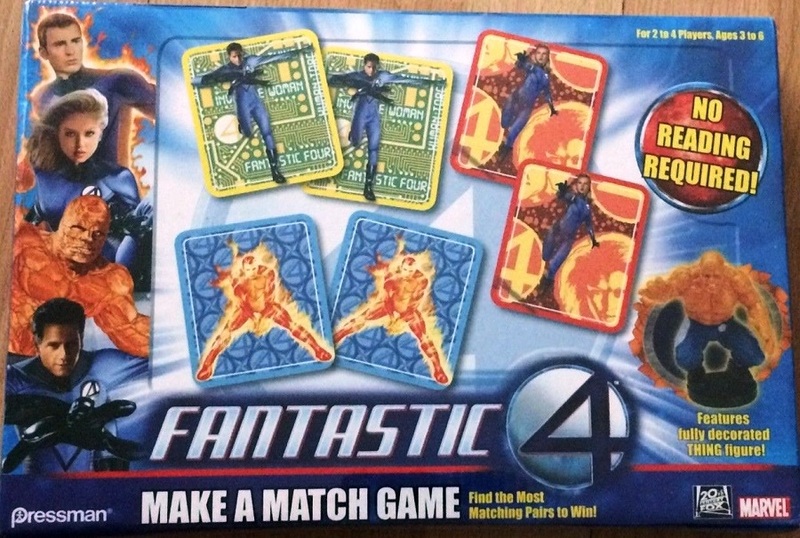 Keep the kids entertained with this official Fantastic Four card game on offer by Marvel. Players go head-to-head in a battle of wits as they take on the role of either Dr. Doom or The Fantastic Four. Wipe out your opponents’ Hit Points using your Attack cards or get them into position using your Strategy cards. It’s fun, fast gameplay that will keep your kids entertained for hours. Who can resist a game of monopoly? Especially if it’s a Fantastic Four themed game. Now kids can play against each other on this collector’s edition of that age-old game buying and selling properties, such as Mephisto and Doctor Doom. Featuring comic book art and customized components it’s hard not to feel a part of the gang while playing this game. Designed with the older kid in mind, this PlayStation 2 game is action packed the whole way through. Choose to be whichever member of the Fantastic Four team you want when you need them with the character switching mode as you make your way through the various environments laid out before you fighting off evil Dr. Doom and other enemies as you go. Another classic game with a great Fantastic Four spin on it is the fun-loving family game, Uno. While it still retains some of the classic Uno gameplay features, there are 112 custom cards to enjoy all the Fantastic Four characters as well as some of their evil arch enemies. There’s also a special N-Zone card feature that’s been added to spice up the gameplay. Let your kids’ imaginations run wild with this Fantastic Four figurine set. Each pack comprises of The Thing, Mr. Fantastic, Invisible Woman, and the H.E.R.B.I.E. robot and is all they need to defeat the evil Dr. Doom and his cronies. Officially licensed and designed with the younger audience in mind, these figures will have your kids playing for hours. Your kids’ memory skills are put to the test in this simple card matching game. It’s another Fantastic Four themed game that's been designed with the younger audience in mind. Players take turns picking cards to try and find a match. If a match is found the player gets to keep the card. The player with the most cards at the end wins the game. We hope you found the above useful and are now ready to make your next Fantastic Four game purchase. Just remember that you don’t have to be a kid to enjoy kid’s games and you’re never too old to have fun. So, with that in mind, what are you waiting for? Go grab your next Fantastic Four game today!